Saturday marks the 30th anniversary of the release of Bull Durham, a beloved film considered a classic by many. 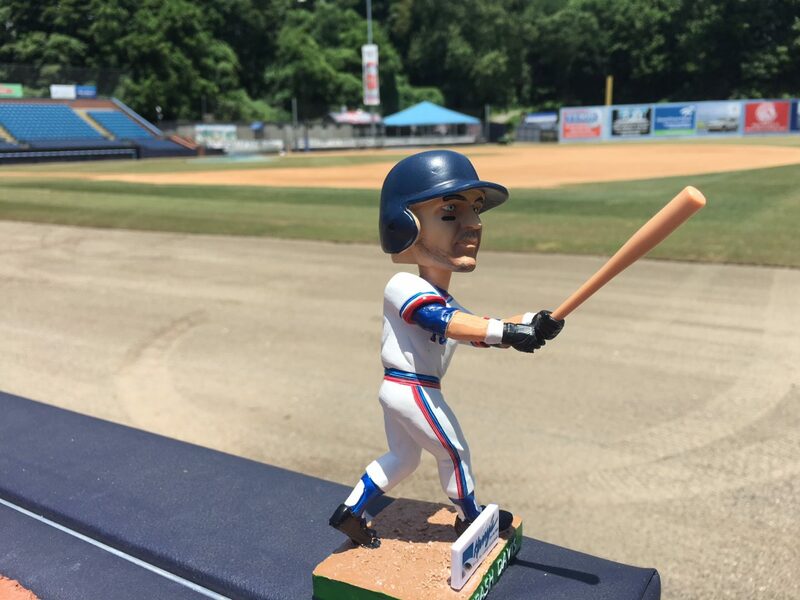 The Asheville Tourists will celebrate by giving away a Crash Davis bobblehead to the first 1,000 people in the gates on Saturday. The Asheville Tourists players will be wearing retro Crash Davis jerseys, and there’s a commemorative program. The jerseys will be auctioned off to benefit the Asheville Tourists Children’s Fund. 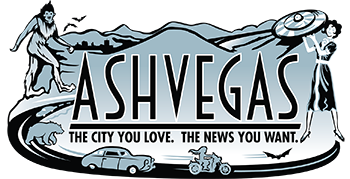 Ron Shelton, the movie’s director, will be in Durham tonight to throw out the first pitch of the Durham Bulls game, the Raleigh News & Observer reports. Read their full report, which includes Bull Durham trivia for the movie shoot there. Kevin Costner played Crash Davis, a minor league veteran catcher who had a brief stint in the majors but never quite broke through. Tim Robbins plays “Nuke” LaLoosh, a pitcher with a million dollar arm and about as smart as a rock. Susan Sarandon plays Annie Savoy, a baseball groupie who both men fall for over the course of the film when Crash is brought in to mentor Laroosh. Most of the movie was filmed in Durham, but a short segment at the end of the movie shows Crash coming to Asheville after the Durham Bulls drop him and the Asheville Tourists pick him up. Crash smacks a minor league record 247th home run before a sparse crowd during a game at historic McCormick Field. -The Asheville scenes for Bull Durham were filmed over a sunny day in early October 1987. A 40-man crew spent about six hours shooting Crash’s home run scene. About 75 extras were on hand to be in the crowd and be shown as fans and vendors. -Costner, an athletic baseball player, was a natural left-hander, but he could also hit right-handed. The movie director wanted him to hit the home run ball as a right-hander going yard over the left field wall. After several tries, Costner couldn’t lift it, so the movie crew brought in the coach of the UNC Asheville baseball team, Ken Bagwell. Standing at the short-stop position, Bagwell used a fungo bat to hit the ball over the wall and get just the right trajectory for the scene. -Several members of the UNC Asheville baseball team wanted to be extras in the movie, but NCAA rules wouldn’t allow it. Terry Gahagan, who’s now an insurance agent in town, was an upperclassman on the team and decided he didn’t have anything to lose. He ended up in the movie as the second baseman seen briefly kicking up some dirt in disgust at Crash’s home run. 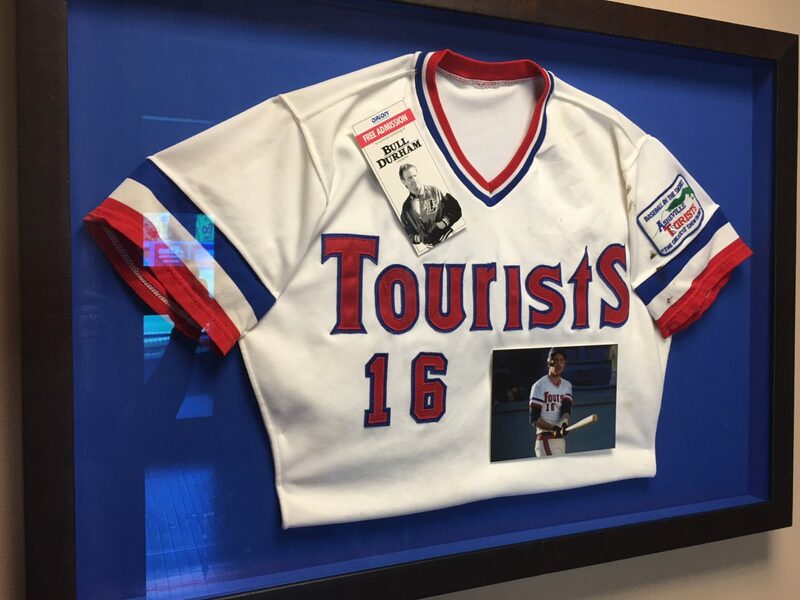 -The jersey that Costner wore in the movie is on display in the offices of the Asheville Tourists, along with a movie still from the Bull Durham shoot. -When Bull Durham was released in the summer of 1988, it was up against a number of other movies at local theaters, including: Rambo III, The Presidio, Willow, Funny Farm, Moonstruck and Three Men and A Baby. -McCormick Field was showing its age at the time of the movie shoot. The park opened in 1924, but hadn’t gotten much love since. It still had wooden bleachers at the time of the Bull Durham filming. -A baseball mural that appears in the movie still exists. Look for it on the locker room building down the third base line. 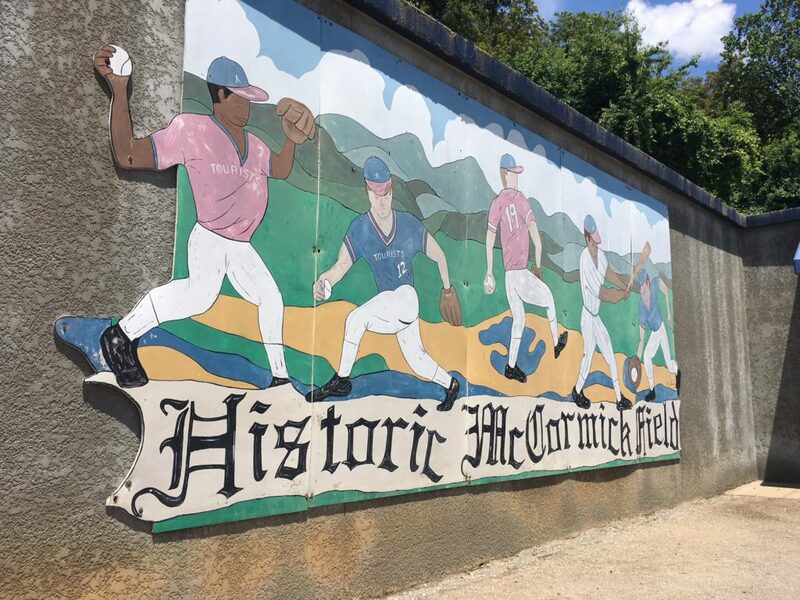 -Aside from fictional Crash, McCormick Field has hosted many famous real baseball players, including Babe Ruth, Lou Gehrig, Cal Ripkin and Jackie Robinson, just to name a few. -The real Asheville Tourists officially drew 104,060 fans during the 1987 season, one of the highest totals for a South Atlantic League team at the time. In 2017, over the course of 68 home games, the Asheville Tourists drew an all-time regular season attendance record of 184,019 total fans. The Asheville Tourists have such a cool history! From Thomas Wolfe serving as a bat boy before WWI to Bull Durham to today, we are lucky to have such a fun and historic team in the center of our community.